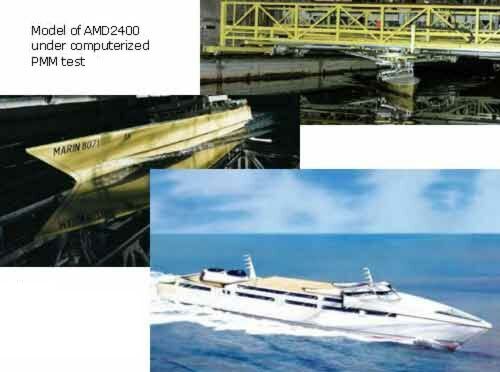 A number of our customers, both operators and shipyards, have recognised that AMD personnel's previous experience with ocean going ships and steel work boats can be combined with AMD's current high speed catamaran design capability for the development or improvement of other types of high speed vessels. A number of proposals for high speed monohull car ferries have been prepared for potential customers, and one of these was selected by a Netherlands shipyard for extra joint venture development. The resulting vessel, the AMD2400 monohull vehicle ferry, is the product of an extensive design study which included detailed hull structure calculations, resistance tank tests and powering determination, and manoeuvring tests. Such a study provides the necessary foundation information for extrapolation to smaller or larger vessels of the same type. Associates of AMD have carried out considerable research on SWATH and Hovercraft vessels. Through cooperative license agreements with these associates, AMD is able to combine the raw research data with our fast ferry design capability and experience to produce viable SWATH and Hovercraft vessels for use as ferries, research vessels and military craft. Please contact AMD to discuss your requirements.